Home › Combi Freighter › Combi Freighter 19000 › Combi Freighter 13500 "BBC Peru"
On December 7, 2012, the documents were signed for the handing over of the Damen Combi Freighter 13500, MV ‘BBC Peru’, the second vessel of this type. She was delivered to Scheepvaartonderneming Tinnum BV, which is managed by MV Tinnum BV and owned by Reederei Eckhoff of Jork, Germany. For Reederei Eckhoff this is the seventh Damen Combi Freighter to join its fleet. 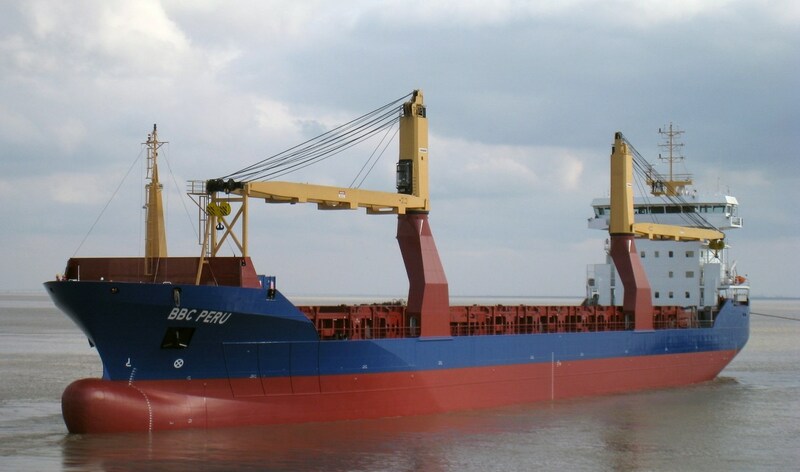 The original name of the vessel was ‘Tinnum’ but as the vessel has been chartered by BBC Chartering & Logistic GmbH & Co.KG in Leer, Germany, she has been renamed ‘BBC Peru’.